As Amon Amarth popularity keeps rising all over the planet, it was bound to happen that new, young, up-and-coming band was going to ride the same stormy chopped pagan-populated waters. The wave of the Norsk bravery kept rolling high and finally reached Homer, Alaska, where some guy named Hiram Lohr put a band together with a strange title Thousand Year War. The “band” would actually be an overstatement, as it is my understanding that the bass and drum players were studio musicians for hire. Most of the guitars and vocals, and probably all of the music and concept behind Thousand Year War must be Hiram Lohr’s creation. Not to give you a faulty impression that Thousand Year War is a mere Amon Amarth clone, but you are sure to recognize the Swedes’ style in bouncy battle-forward riffs of Defiance and The Sea, and even “Thor, Odin’s son, protector …” seems to fall nicely onto the melodic wall-of-sound chorus of Defiance. Yet Thousand Year War wants to stretch itself in terms of songwriting, and as the album develops, more and more nuggets of their own continue to surface. It is if the allegiances of the band need to be declared early, with their own take on the style to follow. The twin guitar melodies in The Sea continuously build up and will definitely make for a favorable impression. Thrashy and bubbly Open Casket screams with brimless energy, another positive attribute for the band. The playful riff of No Gods, No Masters sets up the tone, and pulls back in the 2nd part of the chorus yielding way to some rebellious tremolo. Yes, this defiant, proud, noisy and unpolished way of guitar playing, supported and propelled by the double bass punches (Amon Amarth needs to be mentioned again) is a significant part of how melodies are structured on Tyrants and Men. Mid-way through Thousand Year War covers The Storm I Ride by I, and yet another influence on the band’s style comes into focus. The raspiness in Hiram Lohr’s vocals never reaches the growling depths of Johan Hegg, and Abbath sounds more grim and creaky, but the vocals manage well enough on Tyrants and Men. 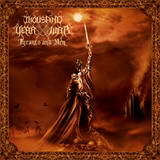 After this cover (which may be a bit too soon for something only a few years old) Thousand Year War shakes the shackles of melodic Swedish death metal off, and does more for itself with the epic and heroic Warriors of Deceit and closing title track, militaristic march of Spartacus and fast bullet-train ride of One Final Breath. The ideas in these cuts still showcase Thousand Year War as its own entity, but do better in the creativity department than the downtuned somewhat hardcorish riff in the middle of the band-eponymous song. Familiarity in the case of Tyrants and Men does not breed contempt, and the album is a solid debut. It can and should be enjoyed for what it is – melodic death metal with familiar Swedish overtones and pagan themes. Where Thousand Year War goes from here is another story, as another album with similar sounding songs would be considered stagnation.